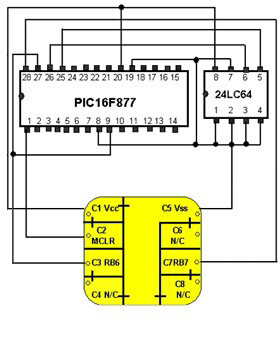 The Smart Card SILVER is a field programmable ISO-7816-1 pin-out compatible multi-chip Smart Card featuring the Microchip Technology, Inc. PIC16F877 + 24LC64 die. The card features an expanded data memory and is ideally suited for applications requiring field programming and reprogramming, short time to market and small to medium volume roll outs. The card may differ from picture as 'Silver' is a generic description of the PIC microcontroller and memory chip, not a description of card colour. They are often white, and can have optional cutout around chip. These cards are really the best on the market, they are the size of a credit card, wafer thin and have a PIC16F877 PIC chip and a 24LC64 EEPROM chip for data storage, which is 8KB. They have far more code storage capabilities than the normal gold wafer cards.